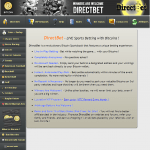 The booming Bitcoin sportsbook market has received yet another site in 2014 – DirectBet. It is a sportsbook that intends to attract bettors with a completely anonymous approach for placing bets with no account necessary, and only the use of Bitcoin wallet address. The rest of the offer falls to Live In-Play betting, as well as a host of popular sporting events. DirectBet’s design lacks any sort of visual impact. Its grey base is quite unappealing and everything seems to stand out thanks to the stark contrast of the font colors used. Because of this design simplicity, you won’t have any problems navigating the site, which is very responsive and excellently optimized. While all information is clearly visible, some sort of customization tool would’ve helped a lot in the way of having more organized bet structure and easier tracking. There is a variety of betting options at DirectBet and their properties differ from one sporting event to the next. The general rule of thumb covers match odds, correct and half time score, half time/full time, with single bets, parlay and more. This sportsbook hasn’t set any requirements for placing a minimum or maximum bet. Instead, the bettor will receive a prompt stating that either his bet is too low or if the sportsbook won’t have the necessary funds to cover his winnings. Live In-Play Betting is the real hook for on spot bettors, with the option to place bets while watching a game and using Bitcoins to do so. With changing odds and increased chances of success, this option is an excellent opportunity to win big. For those who want to familiarize themselves closer with the specific sport rules, DrectBet offers an extensive and quite detailed Rules section, with each sport listed along with necessary information on betting. DirectBet encourages bettors to spend more time at the site with a lucrative VIP program which adds loyalty points for placing bets. One loyalty point is added to the user’s payout address for every 0.001 BTC placed bet. Users get 0.05 BTC reward for 10,000 loyalty points, 0.2 BTC for 35,000 loyalty points and up to 0.75 BTC for 100,000 loyalty points. Users should keep using the same payout address in order to keep receiving the loyalty points in one place. The points accumulated reset every month at midnight. The site offers a lucrative affiliate program for bringing new bettors into the fold, with 1% paid from all bets placed. This covers the bets themselves, meaning that it doesn’t matter if they’re won or lost – you will be paid regardless. You can use the code provided on the official page and promote it to friends, family, websites or forums. As noted earlier, placing a bet at DirectBet is true to the sportsbook’s name – no need for account means you can use your Bitcoin wallet address and deposit directly. The site will process the bet and notify the bettor whether the bet has been accepted or rejected within minutes. The wait times overall are supremely short, as is the withdrawal option which requires the same wallet address. The site offers an option to check the bet status – you only need to enter the Bet ID which is your designated Bitcoin address. You have two available options for contacting DirectBet representatives – via their embedded comment system or using their email address at support@directbet.eu. The responses to issues or questions are prompt and usually take several hours when traffic is high. While certainly new on the Bitcoin sporsbook market, DirectBet has an offer of a seasonal contender. Their approach to anonymous betting should appeal to bettors who have trust issues with online establishments and the fast payments only increase the benefit factor. Promotions are few and far between Bictoin sportsbooks yet DirectBet manages to offer just that with their VIP rewards program, so if you are a dedicated, long term bettor be sure to check them out. The offer of sports and betting option is also impressive, with the Live In-Play Betting being the highlight thanks to the higher odds and increased chances for winning. 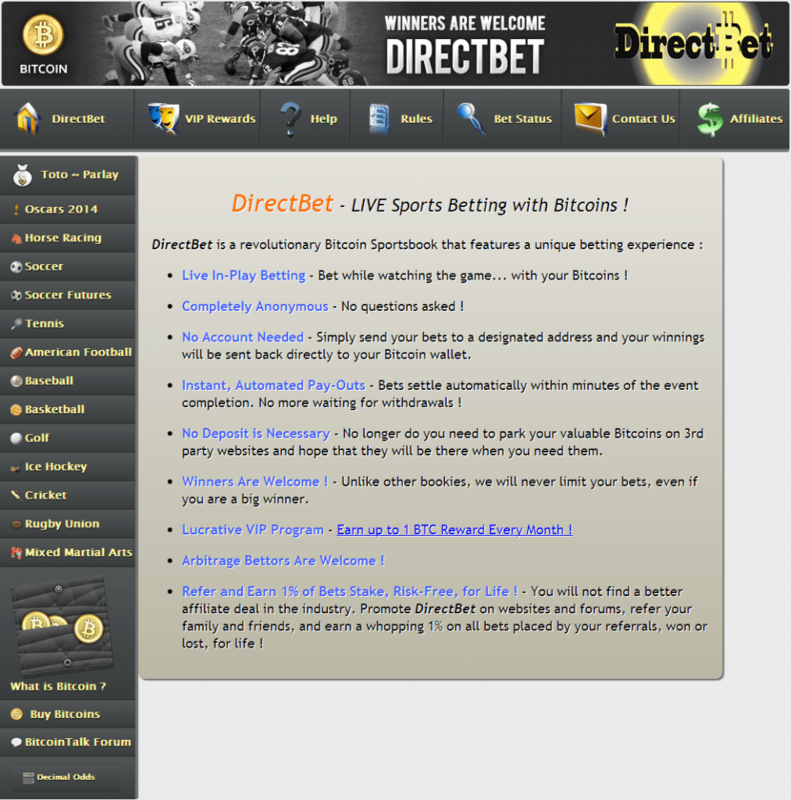 Overall, DirectBet is shaping up to be a great place to spend your quality betting time online, with the safety and instantaneous use of Bitcoins. Give it a try.